Hi, I did a test on my site after embeding the form that i created and when i did a test to receive the submissions, it takes a long time to be completed. It just shows "Please wait.." after i click submit. Please advice, thank you. 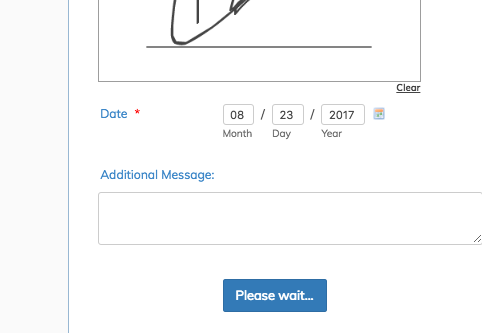 Your form is indeed stuck on Please wait... when I try to submit it straight from your website. On the stand alone version of your form (71640454762457) though, it works as expected. To fix this, remove the form on that page, then re-embed it using the steps outlined on the guide I'm linking below. It's important that you rigorously follow the guide I linked above as the error seems to be caused by the oEmbed Plugin that you're currently using. If that won't work, kindly proceed with the steps listed on the guide below instead.